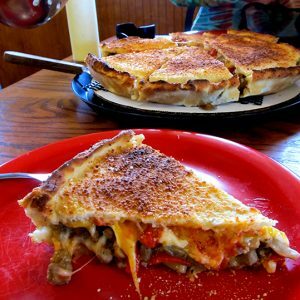 You can’t judge all Arkansas pizzerias against each other pie-to-pie. There’s a lot of difference between DeLuca’s tomatoes-from-Italy sauce and Tommy’s Detroit-style, between Iriana’s thin crust and Steffey’s Uncle Roman. But you can say yes, these are the pies that we crave when we’re thinking about a savory Italian-style pie in The Natural State. DeLuca’s Napoli-style (high heat), thin crust. A sauce of kosher salt and tomatoes from Naples. A simple dough. Lumps of fresh Mozzarella. A high-heat oven. Simple ingredients are rendered extraordinary in the hands of Anthony Valinoti, the former businessman turned pizza troubadour, whose singular energy elevates every dough-borne creation to a communal experience amongst friends. Arrive early on weekend days to secure a dough before they run out (though choosing the oven-baked pasta instead is also quite grand). Napoli-style (high heat), thin crust. Be ready for a climb to get to this tiny restaurant above Hot Springs Bathhouse Row, itself surrounded by layers of terraces. 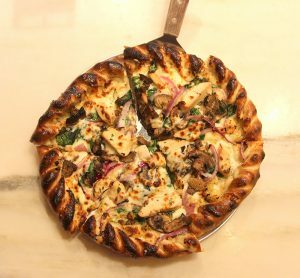 Shared pies are to be celebrated, as is the unique choice of a blue cheese sauce on the Blue Rooster, which pairs remarkably with roasted garlic and onions, chicken and that braided edge crust. Second location; original in Oklahoma. Medium crust, gluten free available. 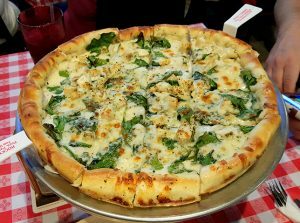 Mountain Home’s modern pizza joint does a variety of different sauces, including a decent Alfredo and a barbecue sauce, on a thin-to-medium crust. Varieties include an Artichoke Spinach Alfredo with chicken and lots of garlic. Medium crust, gluten free available. Iriana’s thin crust pizza slice. Downtown Little Rock’s longtime cracker-crust standard offers the famed Sweep the Floor for those wanting a bit of everything. The alternative Plow the Garden complete with its array of vegetables is equally satisfying. Slices available as well as whole pies. Layla’s Gyro Thin crust pizza. 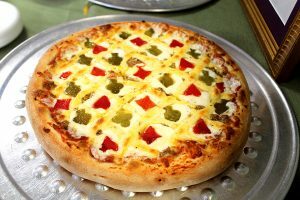 The remarkably cheap and good Mediterranean joint offers standard pepperoni and three meat pies alongside house special gyro, roasted chicken and Greek pizzas – the last of which comes with pickled onions, fresh tomatoes and choice of gyro or chicken and no sauce. A fantastic 12 inches of flatbread wonder. Lazzari Italian Oven’s thin crust pizza. 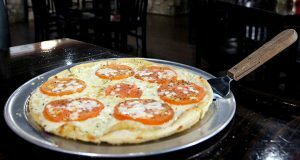 Jonesboro’s longtime Italian favorite offers several pizzas alongside its overwhelming selection of salads and pastas. 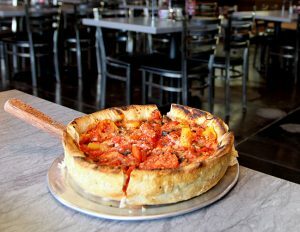 Twelve-inch pies come with your choice of the tomato-packed Pomodoro sauce or Lazzari’s famed Asiago sauce. The Italian Meat and Vegetable Supreme Pizza’s bell peppers, fresh mushrooms, black olives, fresh tomatoes, onions pepperoni, Italian sausage, and bacon is a substantial two-person meal for right at $9. Mojo’s Pints and Pies medium crust, gluten free available. Imagined as a great spot for locals and the music scene, Mojo’s pizzas are finally getting their proper acclaim. The thin-to-medium crust is topped with so many great options in both the specialty selections and the unusual ingredients list (honey drizzle, ghost sauce, yellow squash) is come-back good. Medium crust, gluten free available. 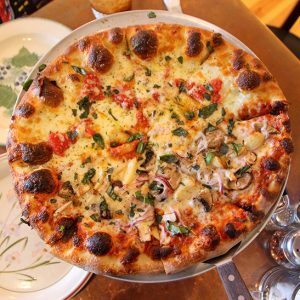 The world’s second-best pizza (as determined at the International Pizza Challenge, where Rick and Jane have taken the second-best prize FOUR TIMES) comes in both traditional versions and the many selections that have earned notice far and wide. 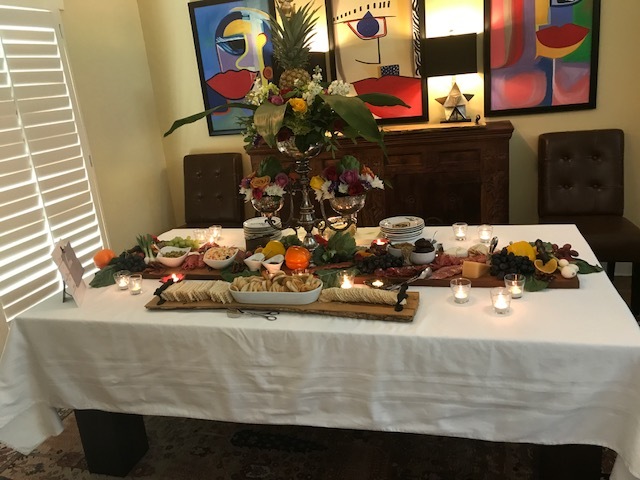 Crazier options include a 2017 runner-up Reuben-inspired corned beef and sauerkraut pie; Loaded Baked Potato with bacon, sweet onion and tomato on olive oil; and an award-winning Spinach pie with roasted garlic white sauce, spinach and cheese. 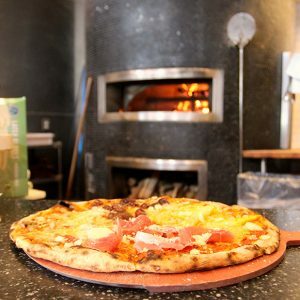 Oven and Tap’s Napoli-style (high-heat), wood-fired, thin crust. Ever had an egg on your pizza? Arugula? Fresh rosemary? 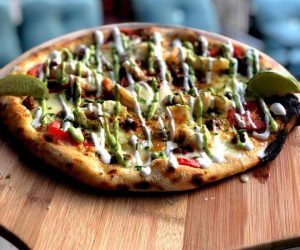 Eager and innovative pioneers of high-heat pizza baking are adding new ingredients to the palate at this hip and nifty spot where everything from ale to espresso is on tap and where the pies coming to table are as colorful as the individuals behind the counter. Napoli-style (high-heat), wood-fired, thin crust. 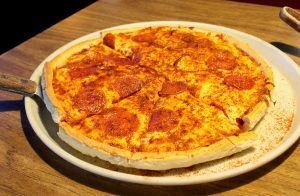 Garrison Avenue’s prime spot for pool and televised sports offers the classic pub-style pie, a medium-to-thick offering a range of crowd pleasers, including the double-pepperoni Goob’s Special, with its thick shaking of Rib Room rub over the top. Just remember the rules – no cell phones on the east side and no playing the jukebox while Jeopardy’s on. Medium crust. Peddler’s Pub Wood-fired, thin crust, gluten free available. This bicycle-themed spot isn’t just for the two-wheeled crowd. Its super-high-heat white and red oak-fired oven bakes pies in two to three minutes, which means you’ll be in and out back on the path in record time. An ample topping selection that includes ribeye steak, Petit Jean ham, artichoke hearts, shiitake mushrooms and shaved parmesan coasts this joint over the top. Wood-fired, thin crust, gluten free available. The Pizzeria in the Heights Napoli-style (high-heat), thin crust. 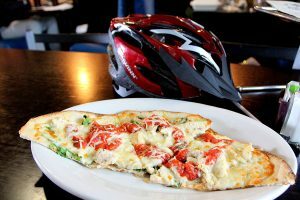 The ultimate in fancy-pants pizza, this gourmet shop on Kavanaugh gives you the opportunity to try 21st century combinations on a thin hot crust – like shrimp scampi, smoked salmon, chorizo, or Petit Jean bacon. The goat cheese cream sauce is a lovely departure from traditional white sauces. Have dessert while you’re there. Hot Springs Rockys Corner bianca pizza. 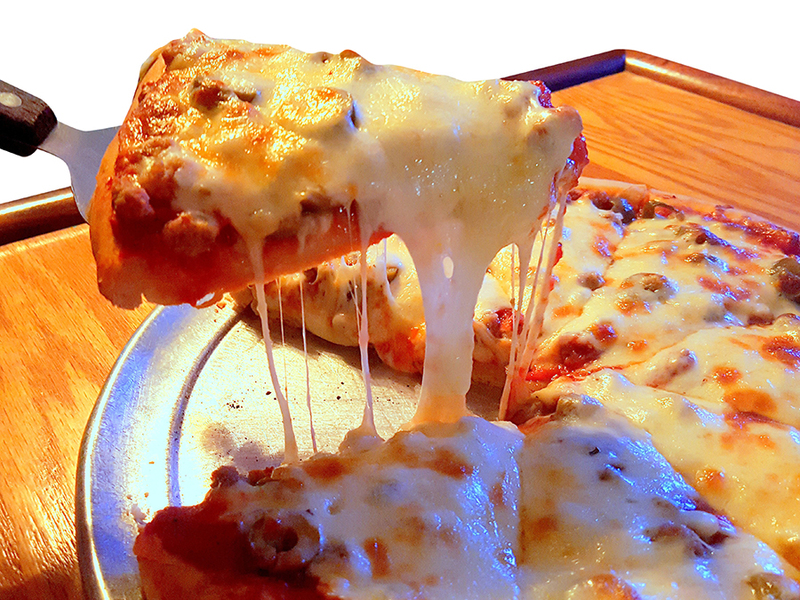 Square cut, rolled edge thick crusts bearing Chicago-worthy amounts of cheese, sauce and ingredients keep patrons returning to this better-than-a-bar-should-be joint across from Oaklawn Park year after year. The red-sauce pies are splendid; the Pizza Bianca is absolutely out of this world. Rods Pizza Cellar, beef pepperoni half green bell half red bell, at Rod’s Pizza Cellar. Whether you choose the biscuit-textured thick or the crispy thin crust, Rod’s longtime family favorites are the perfect straight-out-of-the-70s retro kick you need to wrap up a day at Magic Springs or a lake adventure. Try the house-made beef pepperoni. Humble Pie at Sauce(d) in Little Rock. The interior may be loud (10 oversized screens!) 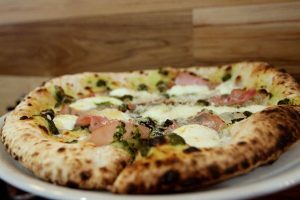 but the pizzas offered at this brand new West Little Rock hot spot are spot-on, with house-cured meats and locally raised produce matched with fresh herbs and a really neat crust. Try the Humble Pie – a simple affair with ever-changing ingredients based on what’s seasonal. 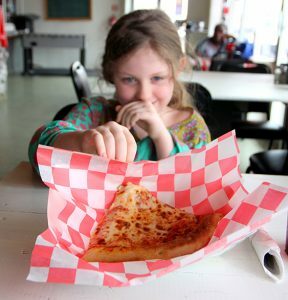 Hunter Robinson with a slice of cheese pizza at Southbound in Helena-West Helena. 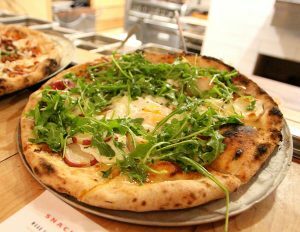 Small, thin crust pizzas perfect for sharing, shine at this Cherry Street destination that claims to hold a doctorate in Southern hospitality. 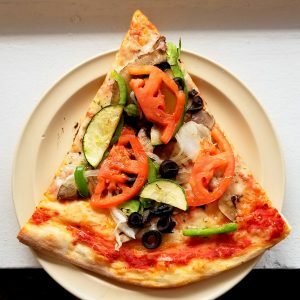 These slices bearing traditional toppings come in seven and twelve-inch rounds are cheap, fun and foldable. Half margherita half triple mushroom pizza at SQZBX in Hot Springs. 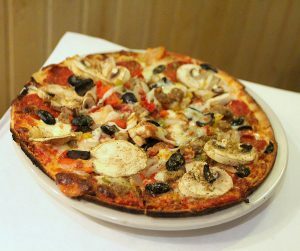 Cold-fermenting gives this slightly-thicker-than-thin crust a particular flavor that matches well with the restaurant’s love of mushrooms in all their glory and differentiation. Great pies are served in a comfortable accordion-and-grand-piano decorated hall with a dogleg bar across the back. 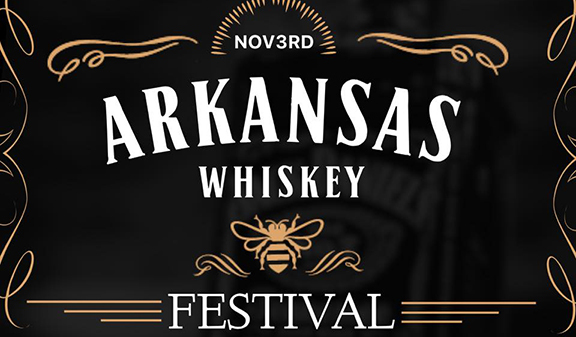 Check for beer specials. Uncle Roman at Steffey’s in Lavaca. 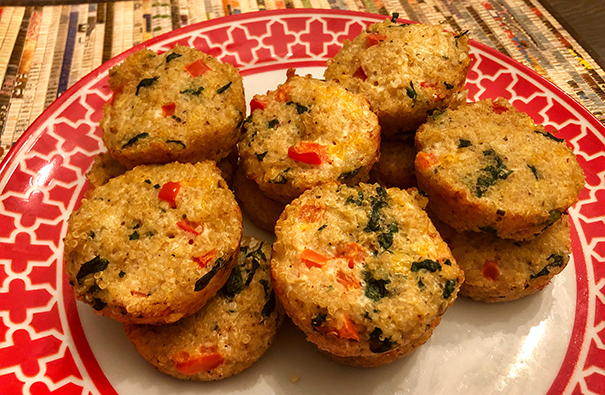 The Pennsylvania-native Steffey family relocated to the Lavaca community southeast of Fort Smith decades ago; their native state’s varieties of cornmeal-dusted pies bear golden crusts and a simple sauce. The pie of most renown, the Uncle Roman, is baked in a cast-iron skillet for 25 minutes to ensure the best cooking of the contents of this inches-thick pie. Beef and zucchini at Tommy’s A Famous Pizzeria in Mountain View. 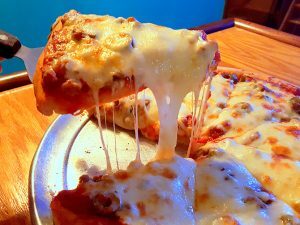 The much-missed Tommy Miller brought together a Chicago sauce and a Detroit crust under Ozark skies to create what may be the state’s most lauded pizza, a square crust, zingy bite some travel two to four hours to savor. Miller’s unusual choices of barbecue pork, walnuts and zucchini remain on the menu. Margherita pizza at Upper Crust in Jonesboro. 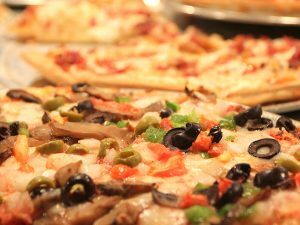 Arkansas State University’s go-to college pizza joint offers thin-crust pies worth sharing at each of its two locations, offering just about anything you might want. Feel like honey roasted turkey? Got that. How about dill pickles? Sure. From hickory smoked pork to Rotel tomatoes, no one bats an eye. Just don’t ask for thick crust – you won’t find it here. 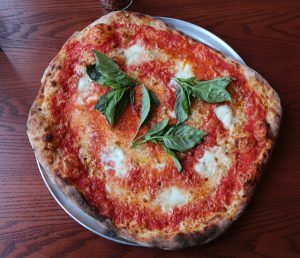 Decades of pizza lovers have split this longtime beer joint’s huge, flat pizzas, in particular a Margherita with loads and loads of basil embedded in cheese. The housemade selection of beer comes back to what pairs best with the pies and calzones that still come from the original paddle-fed ovens in the open kitchen. Order at the counter. The Curly at Wood Stone Craft Pizza in Fayetteville. Thai curry sauce? Buffalo cream? Korean BBQ? Butternut squash puree? Wood Stone Craft turns the traditional idea of marinara or olive oil bases on its head. 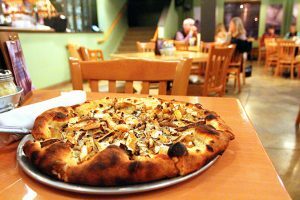 Anything goes on these woodfired flatbread crusts – but the stars of the menu are the varieties featuring locally-collected produce, mushrooms and meats. Quattro Staggioni at ZaZa in Little Rock. It’s been just over ten years since the Yellow Rockets Concept opened its doors in the former Heights Theater, and it has yet to disappoint. High-heat Napoli-style pizzas, an ever-changing seasonal menu of toppings and the perfect pairing with salad and gelato make for delectable dining; people-watching from the high balcony of the second level is an extra bonus. Sometimes, the bottom line must come into play when you’re considering a family meal. 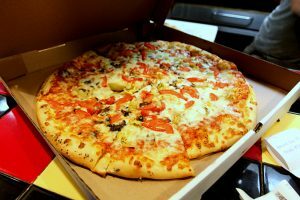 While there are lots of places you can get good pizza, and many places where you can get cheap pizza, few joints cover both of those tasty ideas well. These three, though are ahead of the curve. A supreme pizza at Cavanaugh Pizza in Fort Smith. Feed a family of five on a $20 bill? Yes, you can, especially when you head to Cavanaugh Pizza, where the two-for-one specials carry special weight. 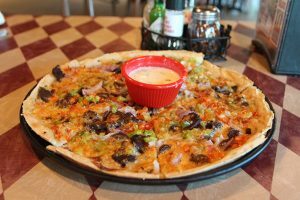 Cavanaugh’s classic thin crust topped with 70’s style combinations of supreme, Hawaiian, meat lover’s and a really fantastic veggie mix are all winners – doubly so for the joint’s taco pizza. The request-friendly pizza buffet is a must-do as well, particularly for Bavarian pizza. Mexican Pizza at Same Ole Joe’s Pizza in Greenbrier. 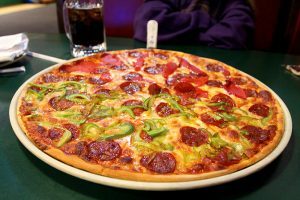 Generous amounts of topping on a somewhat but not too thin crust keep bringing the locals back to the humble goodness of Same Ole Joe’s. The lunch buffet is excellent and always a good deal – as are the pies made to order. 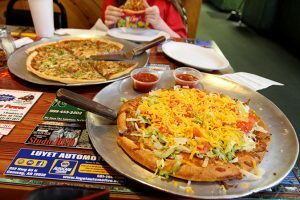 The Mexican with its layer of refried beans is about as wild as you’ll get here, but that’s all right: Same Ole Joe’s relishes in its position as the Greenbrier community’s go-to family-style pizza joint. This longtime family-run restaurant in its unusual H-shaped stone building offers a not-too-thick, not-too-thin Midwestern style dough topped with the combinations you remember from childhood, served in a pizza parlor comfort that will bring back memories. Save room for the cookie dough pizza dessert. Artie at Damgoode Pies in Little Rock. Whether it’s the thick, chewy crust or a stuffy, the pies at Damgoode are meant to sustain. Add in a Venn diagram of sauces (I’ll take pink, please and thank you) and quality ingredients in ample portions, and you get a whole lot of comfort and joy to share. 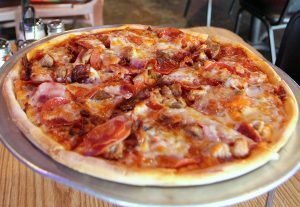 From the Underdog and its ground beef and bell peppers, to the Artie with its artichoke hearts, to the Shrimp Pesto and even the favored choice of The Hog and its four different ways to eat a pig, this pizza joint deserves its name. The Leif Erikson Chicago Style Pizza at Gusano’s in Springdale. In a state that eschews Chicago deep dish, Gusano’s comes closest to answering the craving for sauce-on-the-top over-the-top high-edge deep-dish pizza, the star of a menu that throws all sorts of other Chicago eats – from Italian beef sandwiches to Chicago dogs – at you. A growing spread of Gusano’s means the craving you’ll develop may be satisfied across the state. Philly Cheesesteak at U.S. Pizza Company in Little Rock. 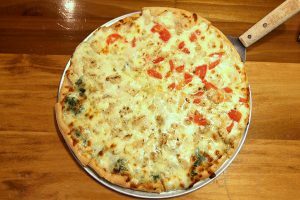 The granddaddy of thin crust purveyors still offers the beloved Dave’s Favorite of chicken, spinach, Anaheim and jalapeno peppers, tomatoes and yellow squash on a creamy Alfredo. But you need to expand your horizons and give Owen’s Philly Cheesesteak a shot – with its roasted beef, onions, sweet bell peppers and crushed red pepper. 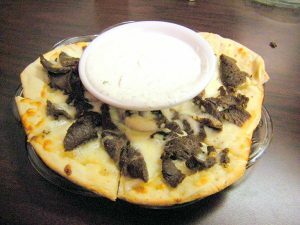 Dip your slice in the cheese dip that comes along for the ride for a surprisingly strong flavor of cheesesteak and happiness.